For centuries, Arviat (pronounced “arq-viat”) has been a site that welcomed visitors to her sandy shores. Much of what makes Arviat an interesting place to visit today is rooted in this history. The industrious Paallirmiut were the original residents of this coastal area of western Hudson Bay in the Kivalliq Region of Nunavut, Canada. A self-sufficient group of Inuit, they were able to sustain large camps. 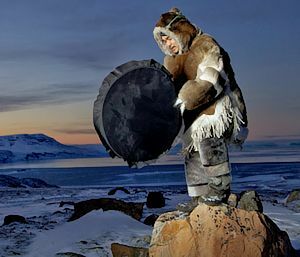 They were joined by the traditionally isolated Ahiarmiut — inland Inuit who knew only caribou — and by sophisticated ex-whalers from the Repulse Bay and Coral Harbour areas. The way these groups hunt, raise children, speak, build igluit, make tools and sew clothes, all differs. Each group has struggled to keep its own identity while uniting to build a community that can creatively address the social problems of today. The community is recognized as being particularly rich in traditional knowledge and values, where Inuktitut is spoken widely and valued highly, and where hunting traditions are maintained. Still identified on many maps by its former name, Eskimo Point, Arviat comes from the Inuktitut name for bowhead whale, arviq. Thule culture sites here date back to AD 1100. The Paallirmiut Inuits moved into this area about 1600 AD. Many ancient qajaq stands found at traditional summer camp sites are evidence that hundreds of Inuit gathered in this area. Summer brought Paallirmiut families together to hunt whales, seals, and walrus for meat and oil. Two of these sites, Arvia’juaq (an island shaped like a big bowhead) and Qikiqtaarjuk (little island), were designated National Historic Sites in 1995. The coast of Hudson Bay near Arviat was a traditional summer hunting location for a subgroup of the largest band of Caribou Inuit, the Paallirmiut (‘people of the willow’). Their ancient camping grounds are located eight kilometres (five miles) from present-day Arviat. When the Hudson Bay Company (HBC) set up a trading post here in 1921 they called it Eskimo Point. The HBC post attracted Inuit to the area, because trapping was a profitable trade. Arctic fox were plentiful and the harsh Keewatin (now called Kivalliq) climate ensured thick, full coats. Catholic and Anglican missions arrived in 1924 and 1926. Caribou migration patterns changed in the late 1920s, making them difficult to hunt. 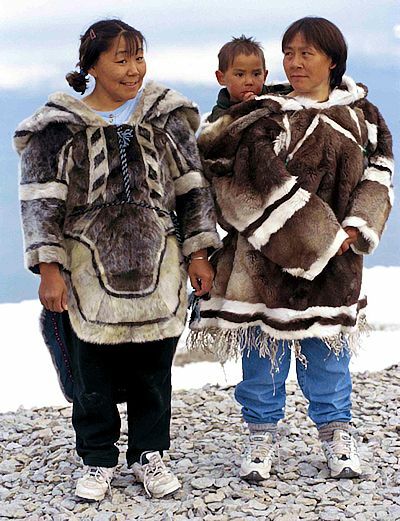 At the same time the market for furs collapsed, creating hardship for many groups of inland Inuit — especially the Paallirmiut, the Tahiuharmiut (a subgroup of Paallirmiut) and the Ihalmiut (also called Ahiarmiut). The Ihalmiut were the hardest hit. The churches provided relief and medical help. The Royal Canadian Mounted Police established a permanent RCMP station here in 1937, which brought stability and governance. 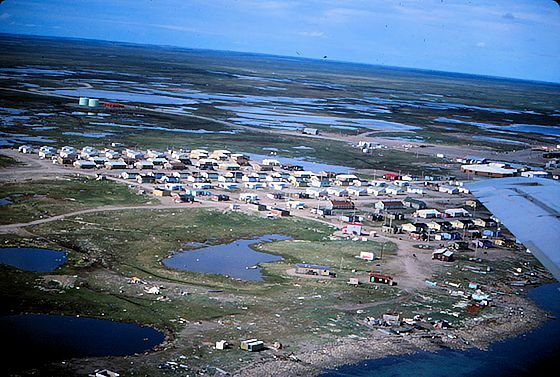 Famine and disease struck this region in the 1940s and persisted until the late 1950s when the Government of Canada resettled a group of Ihalmiut (‘people from beyond’) from Ennadai Lake to Eskimo Point. A federal day school was built in 1959, followed by a medical clinic in 1960, marking the beginning years of permanent settlement. The English name of Eskimo Point was changed to Arviat on June 1, 1989. A visit to Nuvuk, the site of the old post, will introduce visitors to one of the last York boats to ply the waters of Hudson Bay. It carried supplies in trade for furs. The early history of the Roman Catholic mission, established in 1924, can be viewed through exhibits at the Mikilaaq Centre, a diocese-operated community centre located in the original Roman Catholic church. The Anglican mission, founded in 1926, brought missionaries Donald and Winifred Marsh of England to the Arctic. Their books, including Echoes From a Frozen Land , paint a colorful picture of the area in the early days. At the same time that caribou migration patterns changed, demand for furs dwindled, creating hardship for many groups of Inuit. Among the hardest hit were the Ahiarmiut, described in Canadian author Farley Mowat’s books, People of the Deer (Death of a People) and The Desperate People . Eventually, the Canadian government relocated them to Arviat. The community’s Federal Day School opened in 1959, marking the beginning of permanent settlement. Dotted with shallow lakes, this land, rich in flora and fauna, is glacial terrain consisting of sandy low marsh, muskeg, and long tidal flats. Between June and August, the area attracts thousands of nesting migratory birds. The Paallirmiut, south of the community, is a good spot to view nesting pairs of geese, sandhill cranes, swans, ducks and loons. Nesting sites attract snowy owls, peregrine falcons and gyrfalcons. At the tidal flats, swarms of sandpipers, plovers, phalaropes, arctic terns, gulls and jaegers can also be found, fiercely protecting their nests. A short walk from town will introduce you to this rich feathered world. 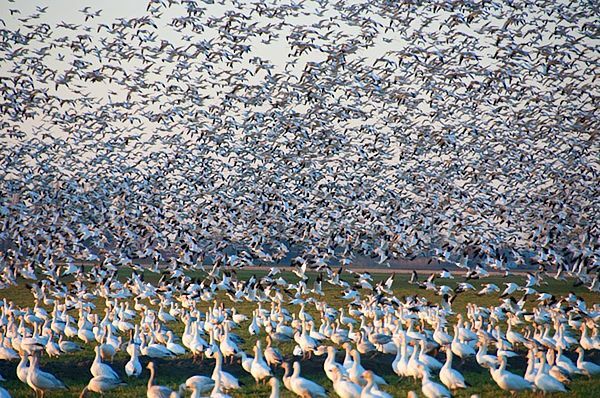 In August and September, snow geese are especially accommodating, when parents march their gaggles right into town, taking over any grassy spots left to nibble. Pods of belugas can be seen in the bays. Many Inuit hunt whales at this time and trips can always be arranged. Trips up rivers near the community take you to great fishing grounds where you’ll also see migrating caribou. Caribou hide is still widely used for winter clothing, and families camp at caribou grounds at this time of year. Venturing out on the land on cross-country skis, by dog sled, snowmobile or ATV, is a great way to enjoy the natural serenity and breathtaking views of this place. The spring and summer months are the best time to explore the vast landscape. Fishing is very popular here; you can catch lake trout, grayling and arctic char. At various times of the year there are dog team races, snowmobile races, and igloo building competitions. A pleasant summer excursion is a short boat ride from Arviat to the Arvia’juaq and Qikiqtaarjuk National Historic Site, the summer home of the ancient Paallirmiut people. 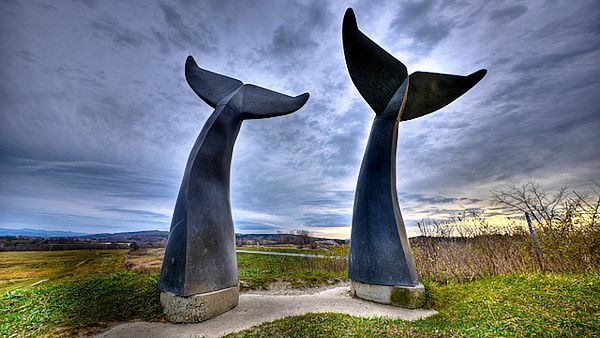 Another notable landmark is the Whale’s Tail Monument where you can enjoy splendid views of Arviat and its surroundings. Wildlife is abundant in the region, with hundreds of thousands of birds, including sandpipers, arctic terns, jaegers, plovers, ducks, swans, cranes, loons, ptarmigans, gyrfalcons, peregrine falcons, snowy owls and snow geese. There are arctic ground squirrels, arctic hares and arctic foxes to be found nearby. Farther inland there are lots of caribou. Along the coast and at the floe edge you can view herds of seals, pods of beluga whales and seasonal migrations of polar bears. Arviat is well known around the Arctic for its artistic qualities. The prized sculptures and carvings made by Arviat artists are unique amongst the Inuit, using an extremely tough local stone. Carving production commenced in the early 1960s and artists soon earned a reputation for their distinctive, rugged style. 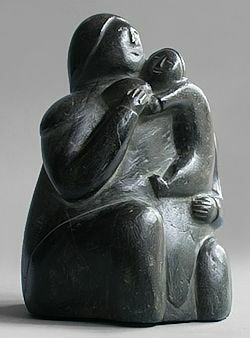 Arviat stone sculpture, while dealing almost exclusively with family and maternal themes, possesses perhaps the least ‘naturalistic’ style in all of Inuit art. The tough, dark grey Arviat stone, called steatite, resists detailed work. Even when softer stone is used, many artists take advantage of the opportunity to simplify forms rather than to elaborate it. Antler carvings, on the other hand, are quite playful and often explore a greater variety of themes. The Ulimaut Carving Shop in Arviat provides a workspace for new carvers. Here, you can watch young carvers at work and meet other members of the local carving community. The community has highly skilled seamstresses producing articles of sealskin clothing that are popular in all of Nunavut, but Arviat is perhaps most famous in the territory for its gifted musical artists, including Charlie Panigoniak and Susan Aglukark . Other well known musicians include Simon Sigyariaq ; the band Uniaqtuq, with Arsene, Pelagie and Mary Angalik; the Arviat Band, with John and Billy Kuksuk, Paul Kattau and others; the Irksuk band, played by Paul Irksuk and sons. All have had CDs recorded commercially. A ten day Inuumariit Music Festival is held each year. The population of Arviat is about 2,800, with Inuit people making up 92% of the population. There is an 80 per cent unemployment rate, and a high birthrate that sees 60 children born yearly. 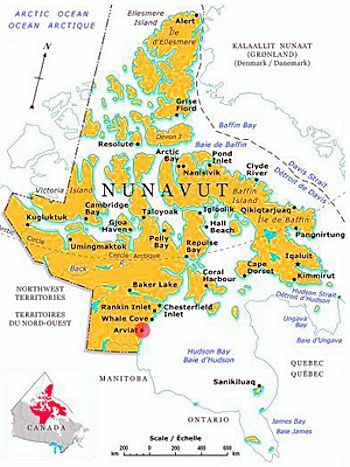 Arviat is the southernmost community on the Nunavut mainland and is close to the geographical center of Canada. In Arviat, Inuktitut and English are primarily spoken, having the third largest population in Nunavut, behind Rankin Inlet and Iqaluit. Three local stores – Padlei Co-op, Northern Stores and EPLS – carry a wide range of products. The only access is by air and snowmobile, but the Nunavut government and the federal Senate member for Nunavut, Dennis Patterson, are investigating the possibility of a highway from Thompson, Lynn Lake, or Gillam to Rankin Inlet, through Arviat. Like other Arctic coast communities there is an annual sealift but it is not available to passengers. To the south, the town of Churchill, Manitoba is accessible by boat, snowmobile and Bombardier from Arviat and is often travelled to for supplies. Arviat has a subarctic climate. Arviat’s landscape is known for its flat tundra expanses, stretching as far as you can see, with glaciated eskers, gravel ridges, patches of sand, innumerable small lakes and an extensive series of rivers. Arviat is situated 90 kilometres (56 miles) north of the tree line. In summertime the land bursts into colour with tiny flowers, lichens, willow bushes and mosses. In the fall the landscape changes hue, with patches of orange, red and yellow. 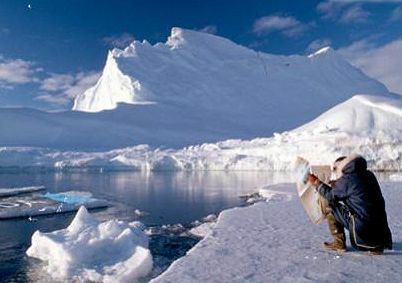 In the winter, it turns into a great expanse of white snow and ice, with an annual snowfall just under 4 feet. With a yearly mean temperature of −9.3 °C (15.3 °F), it is the third warmest community in Nunavut and the maximum of 33.9 °C (93.0 °F) is second only to Kugluktuk. Arviat has a yearly rainfall of 174.4 mm (6.87 in), the fourth wettest in Nunavut but only 112.4 cm (44.3 in) of snow, the third least.